In Eileen Cook’s “Unpredictable,” Sophie Kintock finds herself at a low point. Her boyfriend of six years, Doug, has moved out, and Sophie is having a difficult time letting go. This is why she finds herself in his new, chic condo building’s laundry room one Sunday night, stealing one sock from every pair in his dryer. It gets worse. Doug and his new girlfriend, Melanie, come into the laundry room. They flirt and make small talk, including that Melanie will be going to an upcoming psychic fair.It turns out that stealing socks isn’t Sophie’s only trick. When college professor and professional skeptic Nick McKenna comes into Sophie’s bookstore, asking for a bunch of research regarding psychics, Sophie can’t help herself. With Nick’s help, Sophie learns the tricks of being a professional psychic. She goes to the psychic fair, and fake-accidentally runs into Doug’s new girlfriend. She gives Melanie a reading–even throwing one in for the friend with her–and you can only imagine the “badvice” she provides her rival. Except for one problem. One of Sophie’s most bizarre predictions happens to come true, saving lives, and thrusting psychic Sophie into the limelight. Just before she finally cuts short her career with a confession, guess who calls the radio show she’s on, asking if she’ll take him back. So Sophie is back with her perfect guy, and a perfect, princess-like life ahead of her. The only question is, does she still want it? Eileen Cook’s “Unpredictable” is a fun book. Sophie’s narration crackles with self-deprecating wit and biting sarcasm. We can’t help but love her and root for her, even though Doug sounds like a priggish jackass. What happens as Sophie works her secret plots to win Doug back, is that she outgrows him. She ultimately finds that maybe she’d been less “in love with Doug” than “in love with being in love with Doug.” That’s an important distinction, one that might save many ugly breakups. 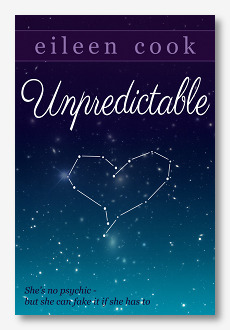 “Unpredictable” doesn’t hold a lot of surprises, story-wise, but this isn’t the type of novel that should. This is the kind of book perfect to read when you need a little fun in your world. One need not be a psychic to intuit how “Unpredictable” will end. It doesn’t matter though, because it’s getting to that end that’s such an enjoyable ride. This entry was posted in Books, General Fiction, Humorous and tagged booksandmoviesandcrap.com, Eileen Cook, Unpredictable. Bookmark the permalink.